The Delphin® swimming discs are unsinkable foam swimming aids for children and adults and can easily be pushed together to suit the swimmer's weight and ability. Delphin® swimming discs: the unsinkable swimming aid for children and adults. Made from a skin-friendly polyethylene foam, the Delphin® swimming discs can easily be pushed together and taken apart thanks to their design with studs and recesses. 2 to 4 swimming discs worn on each arm will provide every beginner with sufficient confidence during their first attempts at swimming. The swimming discs are ideally suited to use in deep water. The number of discs can either be increased or reduced to correspond with learning progress and confidence. 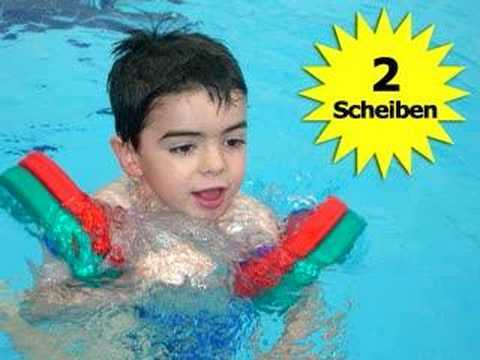 3 swimming discs on each arm for beginners up to 60 kg. 2 on each arm for more advanced swimmers weighing over 60 kg. The discs have been developed and tested over many years of teaching by experienced swimming instructors. The swimming discs' buoyancy can either be increased or reduced by varying the number of discs. The safest and easiest way to learn how to swim – the Delphin® swimming discs.